FENDER CIJ HELLECASTERS LIMITED EDITION (3) - guitarfritzs Jimdo-Page! click to enlarge John and Jerry as well! 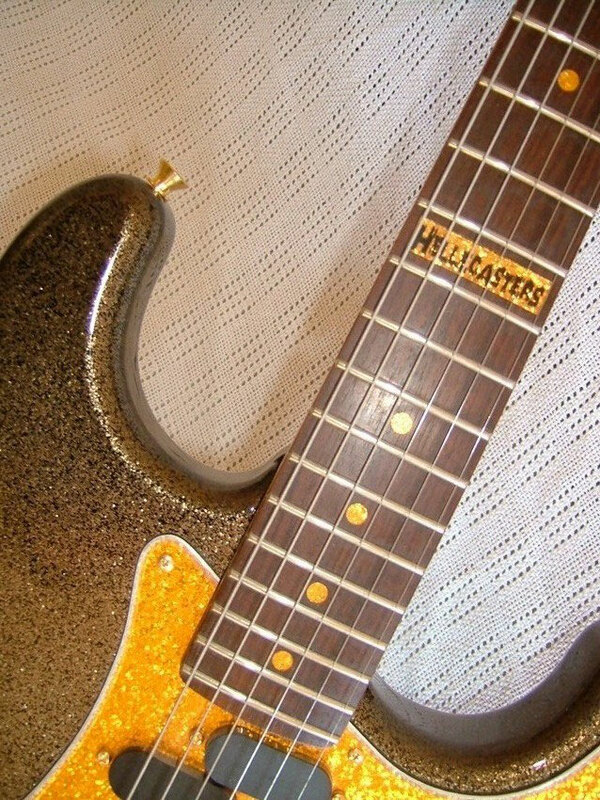 In 1997 and 98 Fender Japan offered this little series of three "Limited Edition" guitars dedicated to and designed by the Hellecasters, Will Ray, Jerry Donahue and John Jorgenson. Not only the awesome look and the rarity but also many special constructional details make these guitars very interesting and collectible. I never succeeded to find out, how "limited" this edition really was. Every instrument has a serial number on the back of the headstock and I never heard about an instrument with a higher number than 400. "I don´t know how many of the limited editions were built but the orders were such that the company extended the time limit by six months! I´ve enjoyed playing the Japanese versions more than most of my others (except in rare cases where the ash is at an optimum weight and tone - there´s nothing to beat that!) as I find, and so did the reviews, their level of workmanship & quality control to be superior. That frustrated the "higher ups" at the head offices and the decision was ultimately made to drop the entire line!" Fender CIJ Ltd. Ed. 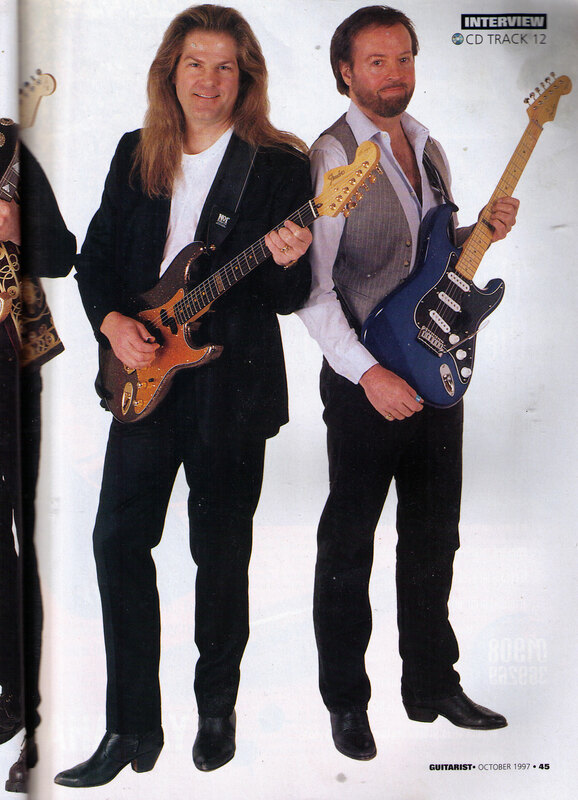 "Jerry Donahue Stratocaster". No funny name for this fantastic creation, unfortunately. 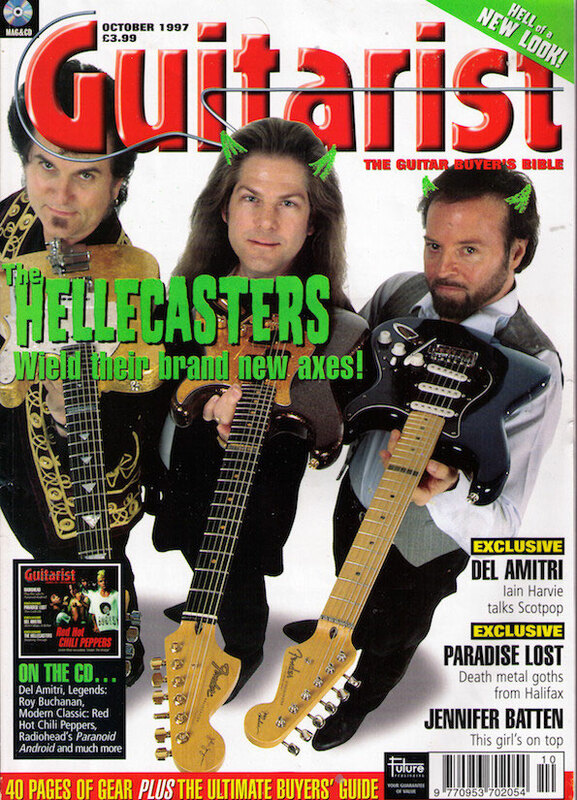 Why didn`t they call it "Jerrycaster" or " Jerry`s Done-a-Huge-Job-a-Caster" ? 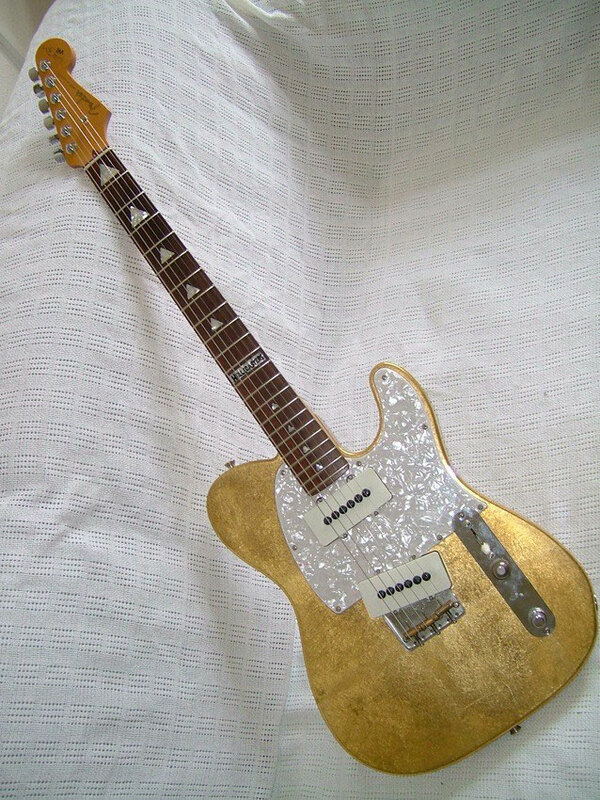 There are many Jerry Donahue signature guitars out there. The JD from Fret King, the Omniac from Peavey and at least two or three Telecasters from Fender and from the Fender Custom Shop. But this here is the only Donahue-Strat ever. Limited edition. No one knows HOW limited. Not even Jerry. This is a fantastic Strat and a unique one. The wiring is unparalled in that the Seymour Duncan pickups mix Tele-, Strat- and exclusive Jerry-Donahue signature tones. There are master volume and master tone pots only. The middle tone pot is not a pot but just a 2-way-rotary switch. Combining it with the 5-way blade selector you get 8 switching options and sounds to choose from. Firstly there are the 5 regular Strat tones, of course. Turn the middle pot over and you get 3 more options for the positions 2, 3 and 4. In position 3 you get neck and bridge pickups in parallel. In position 2 and 4 the neck and the bridge pickup are combined with a secret resistor and a cap in order to produce some slightly "out-of-phase-" or "in-between-" sounds not too far away from what you get in the normal Strat positions there. 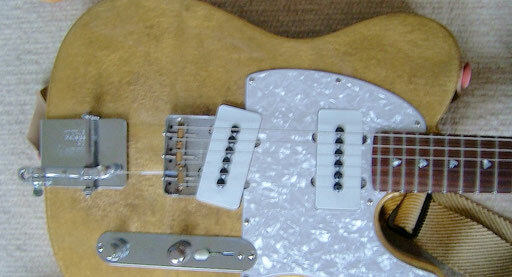 I don`t use these much but I like the normal neck and bridge combination (without resistor and cap) which is pretty close to a politer version of the Tele middle position. That Donahue bridge pickup has a steel plate underneath for more focused mids and some extra winds for more sustain and punch. 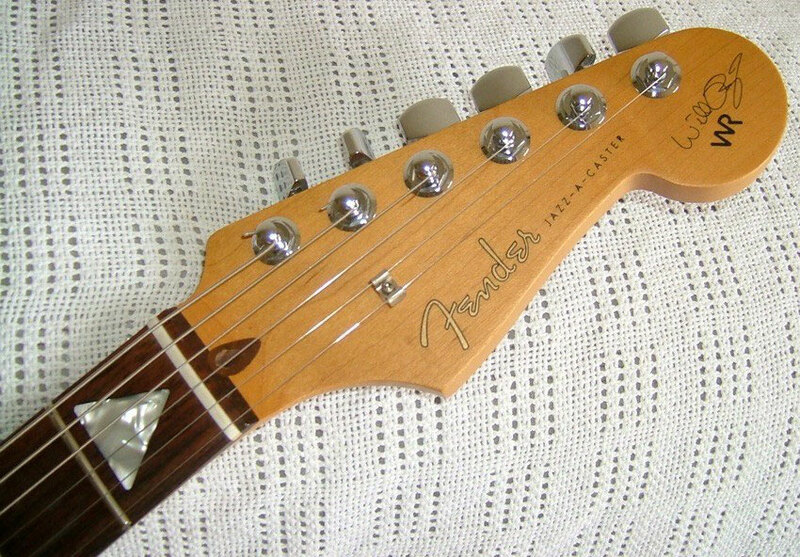 It is similar or almost similar to the Seymour Duncan "Twangbucker". The other pickups are Seymour Duncan vintage style alnico II Strat pickups. 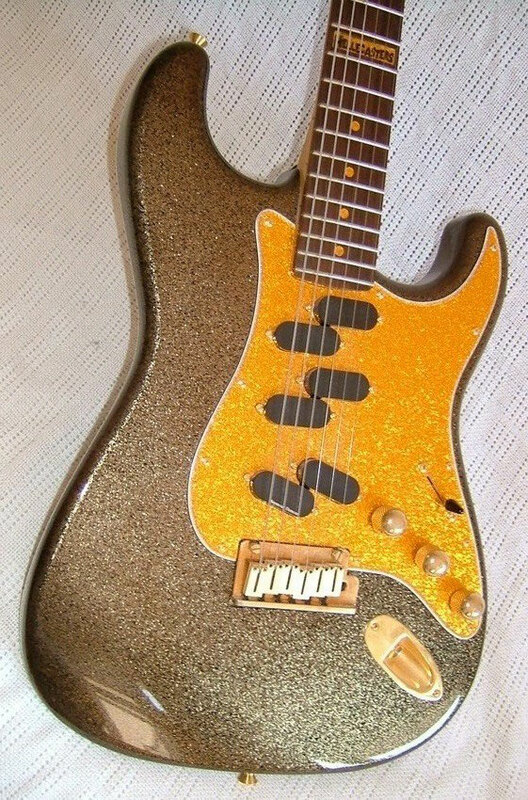 The best thing about this guitar is the neck. One piece maple with vintage frets and a pretty thick profile with a light V-shape. Absolutely fantastic! This was my main guitar for years. Rare blue burst for the body and this pickguard is NOT black. It is a very dark blue with a tiny little bit of sparkle parts in it. My camera refuses to show you that. Sorry! Here you have it on top of my trusty rusted Custom-Shop-Tom-Murphy-aged-Relic-Signature-mailbox! Dark blue with sparkle elements in it - these aren`t dust particles - for a change . This pickguard is one of a kind and irreplaceable. 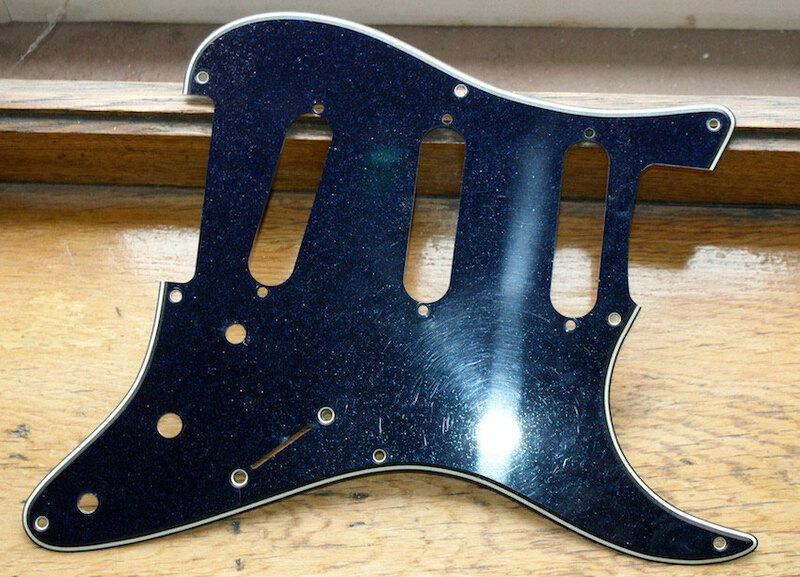 The Donahue Strat`s dark blue sparkle pickguard from the rear: It is black and contains a glued-on shielding foil and a massive glued-in (!) 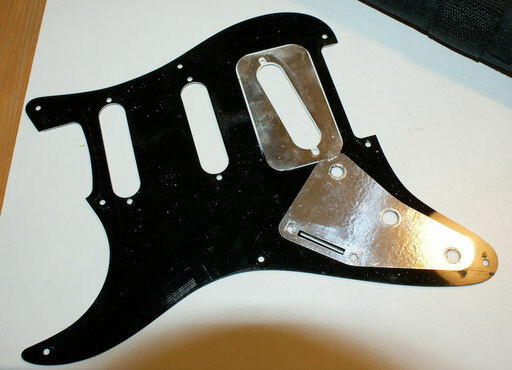 aluminum plate in order to mimic some kind of a Telecaster-style bridge. Never seen this anywhere else! I wanted to hear how this guitar would sound with an alder body instead of the original basswood. So I bought a nice Fender USA Strat body with nitro finish... But then I went back to the original again. "The decision to use basswood was actually mine and here is the reason: Even before the Strat was released, when Fender decided to offer a Japanese version of my Custom Shop Telecaster, I told them I would like them to use the same wood that comes on their `62 reissue Tele (also made in Japan). 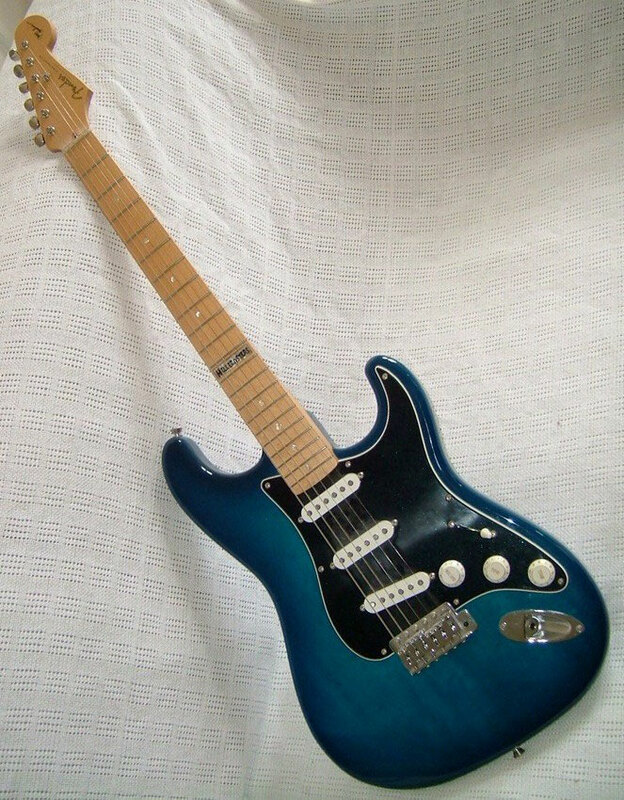 I had tried out many guitars from Fender Japan and found the the ones that were made with ash bodies were very erratic in weight AND sound - and this inconsistancy worried me. On the other hand this `62 reissue, though not quite as magical as an optimum ash guitar (if you are lucky enough to find one), it was a good weight and consistantly satisfactory in its tonal quality - I never found one that I didn´t like. 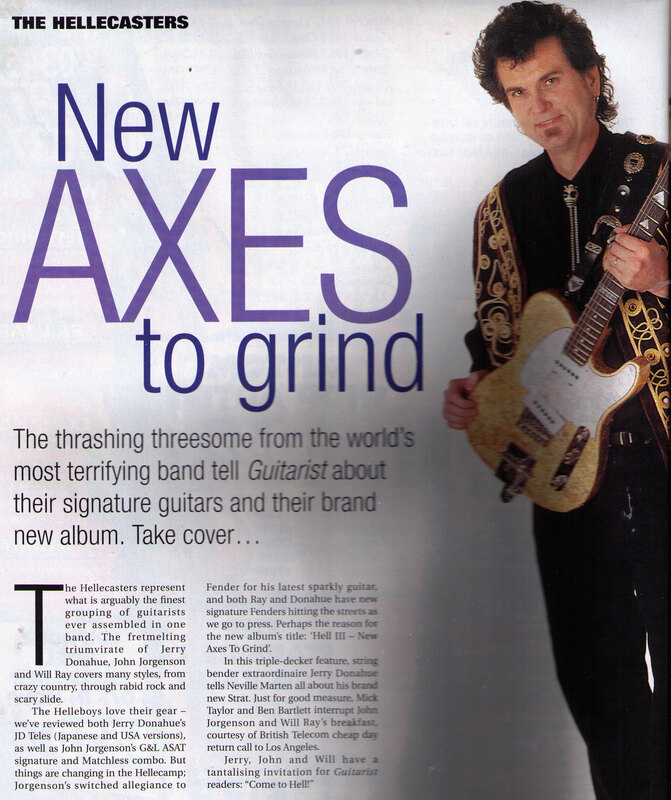 So, rather than taking chances, I opted for the basswood bodies for their version of my Tele and also, later on, when Fender decided to have Japan do the Hellecasters´ set.."
I used this Strat as my main squeeze for some years and always loved how versatile, balanced, transparent and sensitive it sounds. But since I am always curious to learn more about how guitars work I bought this US-made alder Strat body with nitro finish, ignoring that Jerry favours ash. (I already have two ash Fenders but no alder Strat - just a Jazzmaster.) 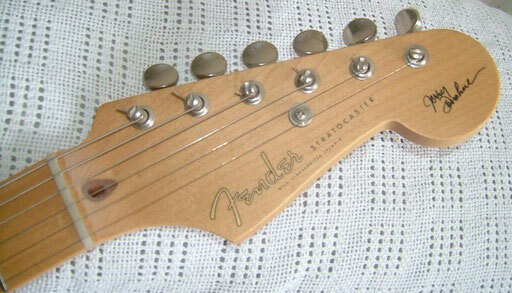 Since many, many guitar players favour alder Strats I just had to try this. 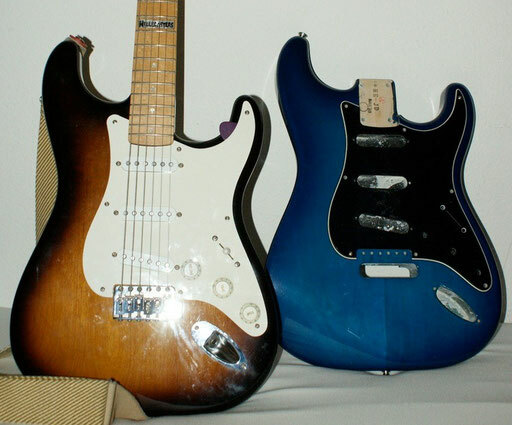 So I guess I`ll better put the original parts back together because this really is a very, very fine Strat. In the meantime I have changed everything on this guitar back to the original state and I`m glad I did so. I must say that the basswood body with urethan finish is a bit brighter, lively and more versatile and open sounding than the US-made alder body with nitro finish that I tried out. This really is a fantastic Stratocaster. Fender CIJ (Crafted in Japan) Limited Edition Will Ray "Jazz-a-caster"
out of focus on this photo but not out of tune: The Hipshot Will Ray B-Bender! Great If you can master it! 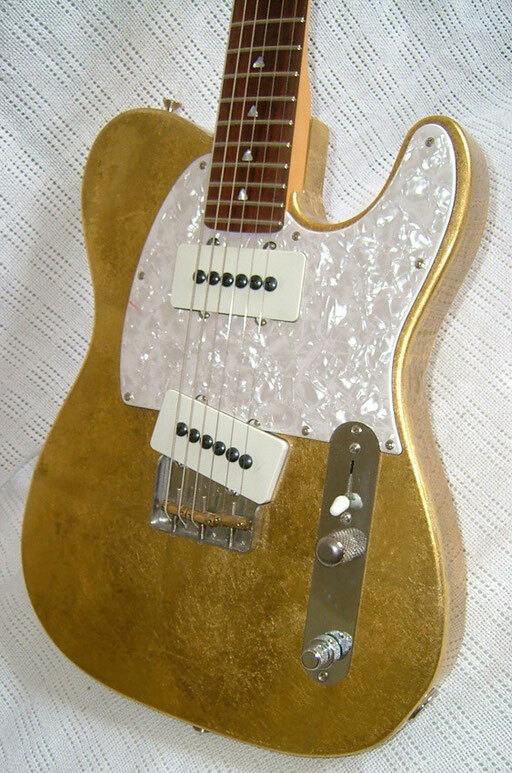 unique Seymour Duncan Jazzmaster-meet-P90- pickups and a bit too much of that terrible mother-of-toilet-seat kitsch. Note the stacked tone pots for treble and bass cut. This Tele has a basswood body, too. As the pole screws clearly show these Seymour Duncan pickups are not real Jazzmaster pickups. They have ceramic magnets underneath the single coil and these ugly steel pole screws. So construction-wise they are almost like P-90s but with wider bobbins. They are hot and bright. You get a 4-way-selector offering the pickups in series as well as in parallel. The stacked tone pot lets you cut off some bass frequencies if you want, which is very usefully especially with that serial pickup combination. 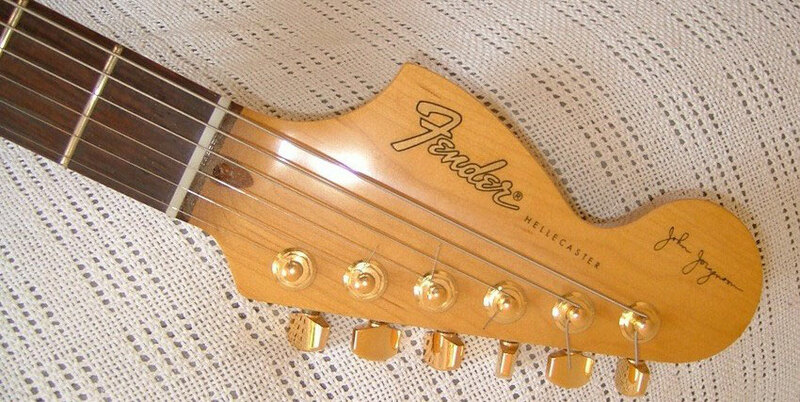 I wish, I could apply this bass roll off for this pickup combination only. That would be perfect! Altough I like a lot how fresh and punchy the guitar sounds I don`t play it any more. The main reason beeing that the neck is pretty slimm. Playability is excellent, but this is just not what I prefer. But this was my main backup guitar for quite a long time and I also gigged it two or three times and it proved to be very flexible and reliable and well sounding. It came with a special Hipshot Will Ray signature B-Bender which I never used. Unfortunately I`m just not good enough to incorporate this wonderful thing in my primitive playing. 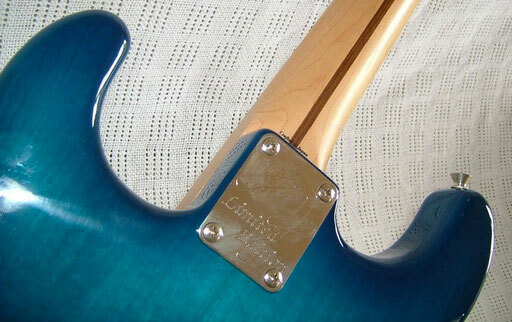 Fender CIJ Ltd. Ed. "John Jorgenson Hellecaster"
This crazy finish is called "champagne sparkle". 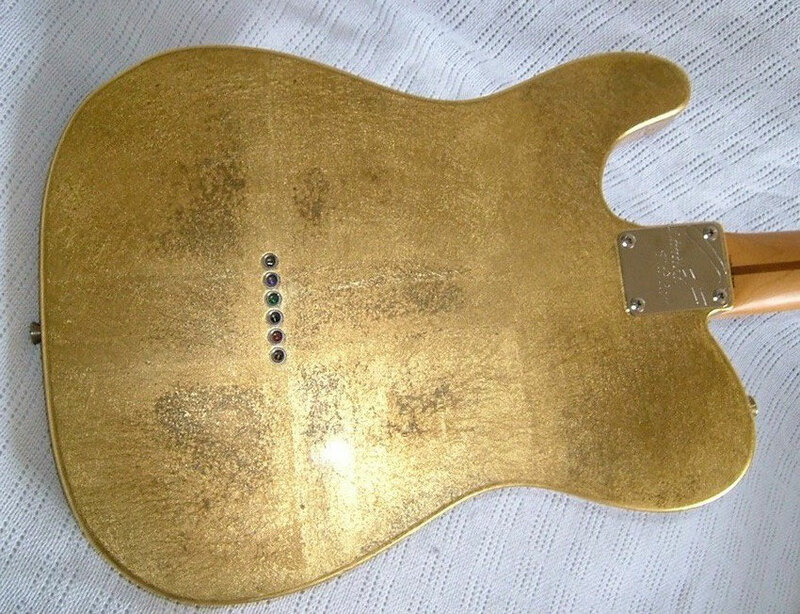 The dots and the pickguard material are also an absolutely unobtainable rarity. It is not the usual gold sparkle stuff you get from WD or others. Definitely as kitschy as the Will Ray model but more beautiful to me. 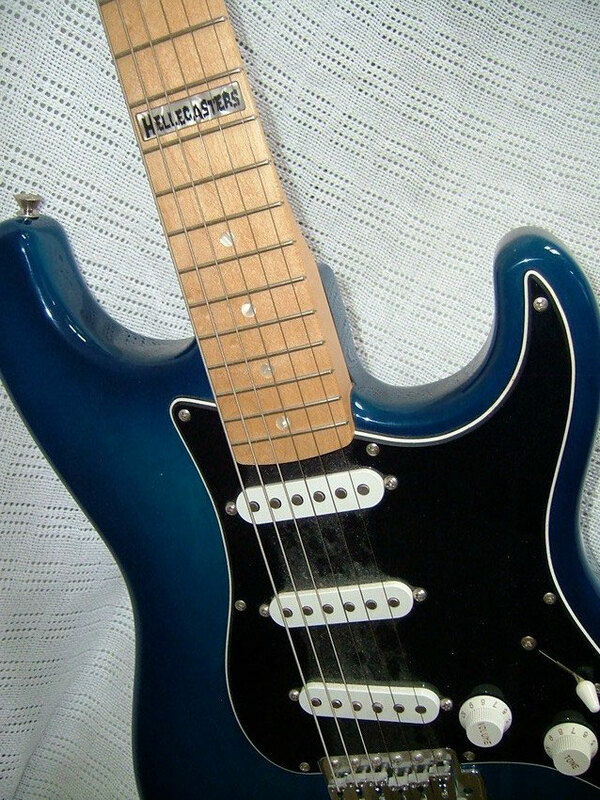 This guitar has a heavy maple body and came with a free floating brass Schaller vibrato. I made a rosewood shim and put it underneath the vibrato because I like it to be flush on the body. Apart from the weight this is a great guitar to gig. No hum there thanks to the Seymour Duncan split singlecoils. The sounds are not "real Stratocaster" though. Mine was one of them. There was one cap too many soldered at the wrong spot, making the whole guitar sound too dark and muddy. John Jorgenson himself and some gearheads in the www helped the customers to solve this problem. and never bothered to answer my inquiries. 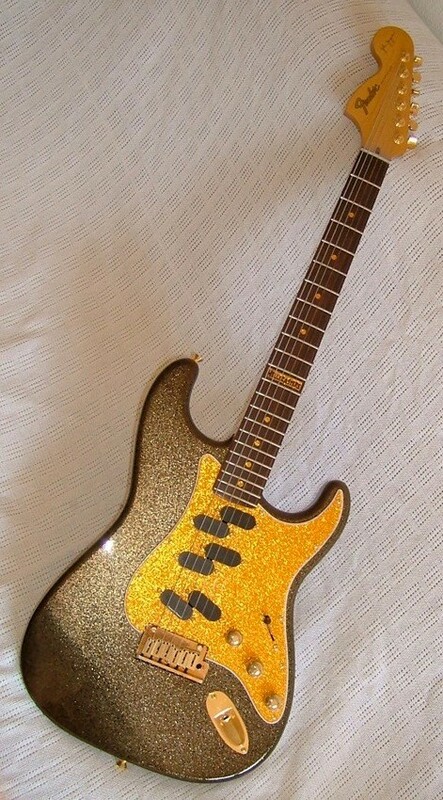 Absolutely no customers support from them for a custom shop limited edition guitar costing more than 1500 bucks? The pots do not need to be changed. and cuts out all the highs! As good as this is - I stil feel that the instrument`s voice lacks a bit of temper or personality. You have plenty of that as far as the visual appearance is concerned, but there isn`t enough "mojo" in these sounds. On the Hellecaster you have a 5-way switch with the usual suspects, but a push-pull knob on the second tone pot as well, bringing in the bridge pickup when neck or neck and middle are selected. That makes for seven pickup combinations. The middle knob is not a treble cut but a bass cut pot. A very seldom seen - but useful - feature. "Reverend" guitars usually come equipped with it and some "G&L" models have it , too. 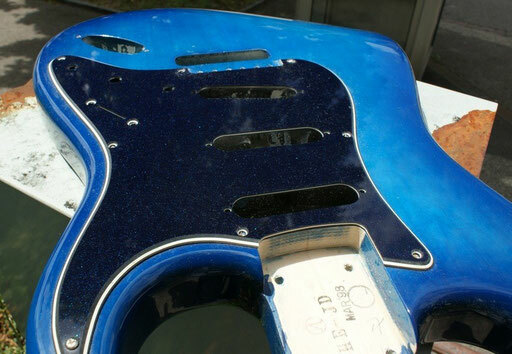 The warmer and fatter your pickups are, the better you can use it to clean up the sound. This guitar can do almost anything and is perfect for a live situation. If you dare to show up with it, that is. But for the studio or for real and pure vintage sounds you`d probably prefer the "real thing". Schaller Brass Tremolo, Duncan hum-free split singlecoils, 7 switching options due to a push-pull switch and a bass contour knob.